A wild SCP-867 specimen prior to destruction. Special Containment Procedures: Specimens of SCP-867 are kept in Section E of Bio-Containment Site-██. Regular maintenance on SCP-867 is only to be performed using remote rovers and automated irrigation systems, and personnel entering the containment area for any reason must wear full-body NBC protection with a Kevlar underlayer. Any personnel exiting SCP-867's containment area must undergo a full herbicidal treatment and inspection, and any personnel found with possible puncture marks must be placed under quarantine for a minimum of fifteen (15) days. Experimentation with SCP-867 requires the written consent of at least two (2) Level 3 personnel. 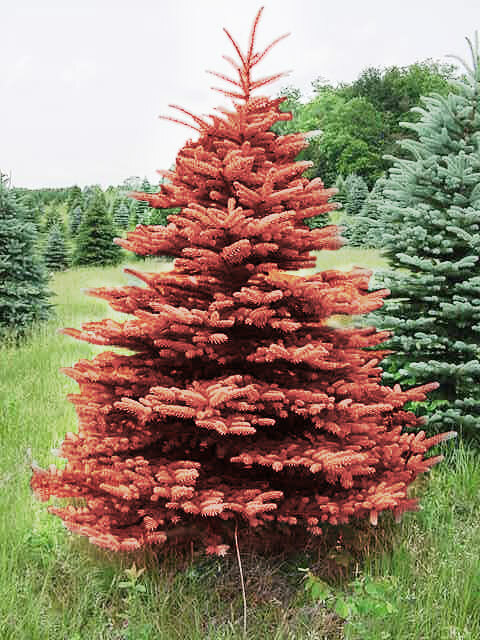 Description: SCP-867 is a species of coniferous tree visually similar to Picea pungens, or blue spruce, except for its distinctive red coloration and a complete lack of seed cones at any stage in its life. SCP-867's leaves are hollow structures similar to hypodermic needles, containing a single long, thin seed and a tiny gas pocket at the base of the leaf. When a living animal brushes against the leaves, the gas pocket expels and injects the seed into the skin of the animal using a mechanism similar to that of an auto-injector. The tiny size of the seed, which is coated with a liquid with anesthetic and coagulant properties, renders the injection essentially undetectable. These seeds can lay dormant in the skin of an animal for up to two (2) weeks, after which the seeds begin to grow, extending tendrils throughout the host animal's circulatory system. This growth causes excruciating pain within the host animal, can last for up to twenty-four (24) hours, and invariably ends with the host's death. Following host death, the new SCP-867 specimen(s) will burst from the host's body and grow to full maturity within thirty (30) days, consuming the host's body in the process. SCP-867 was first discovered in [DATA EXPUNGED], Colorado, following a bizarre series of disappearances of hikers and park rangers in the area in 199█. A Foundation team was dispatched and able to retrieve several young specimens of SCP-867 with acceptable losses. All wild specimens of SCP-867 (approximately ███ in number) were destroyed.